"Hauptbremszylinder (Scheibe/Scheibel) 1,120″ Bohrung schwarz"
This Remaster master cylinder features a small, compact, 1-piece body machined out of 6061 T6 billet aluminum with a 1-1/8″ bore, left side ports and a 2-bolt mounting flange fitting many Ford and GM applications. The billet top is attached with 6 allen screws and has two large billet aluminum, knurled screw-on caps making for easy filling without spillage. The unique outlet port design allows for either inverted flare (w/included removable seats) or banjo style, straight fittings. The Remaster is compatible on most long and short, w/included bullet, boosters or manual brake applications. Optional proportioning valves also available, see below. 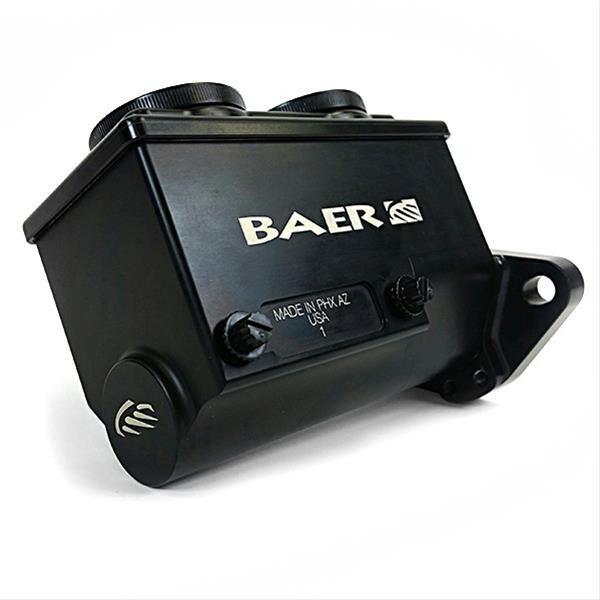 A proportioning valve is recommended on 4 wheel disc brake applications without ABS and Baer has two style valves to choose from. The Remaster specific valve has a one-piece body with integral mount designed to locate the valve directly under the Remaster. Click here for more information on Remaster valve, The General Fit valve can also mount under the Remaster with the optional mounting block, or it can be mounted away from the Remaster if desired. Click here for more information on General fit valve. Both valves come complete with tube nuts as well as removeable brass seats like the Remaster. Select optional proportioning valve below. Select optional line kit below. Some long push rod hydroboost and vacuum boosters require additional spacer, p/n 6260258, to space Remaster away from booster push rod. Click here, for more information or to order.